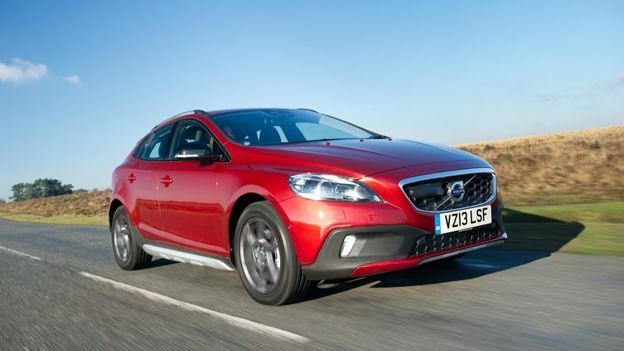 Can the upgraded Volvo V40 impress in our test? We reviewed the original V40 back last year, but this 2013 update welcomes a beefier engine and a host of tech upgrades. Volvo's design team deserve some serious credit. As the Volvo V40 Cross Country pulled up outside the office, it's hard not to feel impressed. Memories of Volvos past are long, boxy creatures, but the sharp angles of the new breed look angry and fast, and the V40 Cross Country is no different. We tested the T5 AWD edition that packs a whopping 2497cc 5 cylinder petrol engine, making it one to avoid for eagle-eyed watchers of their MPG. It's a big car, with an expansive interior that swallows you whole. It boasts a firm yet responsive drive for such a wide vehicle, yet suffers from a insignificant amount of road noise, which can be irritating. With a top speed of 146mph it's no slouch and will do 0-60 in a decent 6.4 seconds. We reviewed the A5 TWD edition, which ditches a manual gearbox and diesel engine found on the entry-level editions for an automatic transmission. This may immediately put off some buyers, and as expected, all the foibles of auto-transmission were present. Put your foot down and the power is delayed by a second, that feels like an eternity when you're picking your gap to overtake. There is salvation, however, in the form of Volvo's semi-manual Geartronic gearbox. While it may be called different things on different cars, this mode enables manual shifts up and down, when pushing the gear stick into 'S' mode. While you're not fully in control, it does aid those moments when you need a big burst of power. 'S' mode also lightens the steering making the V40 feel suddenly alive and responsive. On the tech side there's plenty to get excited about. The built-in entertainment system works well, with decent speakers boasting plenty of bass as usual. There's a host of connectivity options, yet Bluetooth was the only one that offered any sort of compatibility without iPhone. There are USB and audio cable connections in the glovebox but none talked to the iPhone whatsoever, so we stuck to good old Bluetooth. The menu system was needlessly complex, but once it was set up, things worked seamlessly. Over-complication was a running theme with the V40 Cross Country's interior adorned with a bewildering array of buttons, knobs and dials. However, there are some seriously good features. The built-in navigation was actually excellent, some of the best we've seen included as standard. The in-dash screen is huge, and ensured mapping was clear and refreshed smoothly, so there was no uncertainly on roundabouts. The vocal instructions also impressed, but without touchscreen (a bugbear of ours) usability did suffer. Inputting place names was laborious, but when that chore was done, things worked fantastically. One complaint was that the in-car nav didn't ask us if we wanted to avoid toll roads, and a needless trip though central London's congestion charge zone was the result. Reversing is aided by a rear-view camera that also overlays your predicted trajectory, which is extremely handy for reversing in tight spaces. However, we reserved special fondness for the blind spot sensors, which displayed a yellow light when a car is approaching from the left or right. It was correct every time, warning you at sensible distances, never annoyingly over-cautious and soon became a reliable and appreciated aid. The Cross Country moniker no-doubt originates from Volvo's desire for this new and improved V40 to be the adventurer's SUV-style car of choice. We feel they might be right, as long as your adventures involve the Great British highways, they may be right. While there's little here to induce spine-tingling excitement, the comfortable and spacious ride means the V40 Cross County has everything the family needs: top notch safety, a huge boot and enough gusto to put a smile on Dad's face while the little ones fall asleep in the back. From £38,875. As reviewed: £40,425.